MINA V.I.P. members get 10% DISCOUNT when wearing the MINA V.I.P. group tag while buying products in the mainstore. This does not apply to purchases made with a gift card and while playing one of MINA’s gacha machines. Please don’t forget to wear the group tag, we can not give the discount afterwards. MINA V.I.P. membership fee is a one-time cost of $200L. Left-click any hair and select the option: “Gift”. 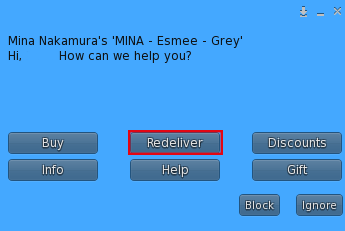 Add the recipients name to the resident-chooser and pick the correct one. A pop-up will appear, you can choose to gift the hair directly, cancel the gift and get it delivered to you or send it in a gift box that will be send to you so you can give it yourself to the desired user. If you want to sent it in a gift box you will get a link to a webpage on which you can select a nice gift box. It will be delivered to your inventory. If you want to rename the gift just rezz it on the ground on a land that permits rezzing. A pop-up will appear. Choose “Change name”. Follow the instructions and take the box back into inventory. You will see the name has changed. If the person already owns the hair you want to gift the system will tell you and refund you the money. Its also possible to buy a gift card and present that as a gift. You can simply hand it over yourself, which gives this a very personal touch. Purchase a gift card of your choice and give it to the person you want to gift it to. 1. Find a hair pack you want to buy from a MINA Hair in store. 3. Touch either “buy” or “buy pack” on the vendor. 5. Just click “BUY NOW” on the giftcard to immediately debit your card and the texture or pack will be delivered to you. If you don’t have enough credit on the giftcard a blue pop up will ask you if you want to pay the extra amount needed to buy the hair you choose. If you choose “yes” the gift card will ask for debit permissions in a new pup op window. Grand permission and you can buy the hair. Hello Dorralious, In the demo you will find a LM to the event and a notecard explaining where you can buy this Event hair.